I don't have the CD anymore just the device. I never needed the CD as I used windows 7 and virtualdub as my capture software. The problem is... Now I updated to windows 10 and decided that I needed to use the device. I have yet to test it. But I assume it works because Virtual Dub recognizes the capture card. I installed it while having it plugged in. The screenshot is what it looks like prior to driver install. Thanks we will pin this and pass it along to those having issues. I installed it while having it plugged in. 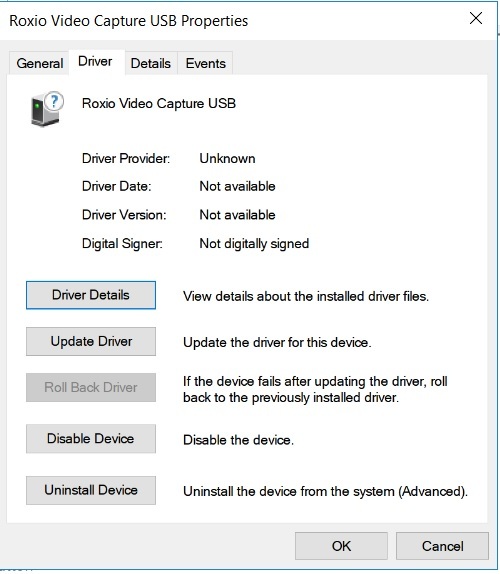 If you plugin the Roxio USB capture device before installing the software with the Roxio driver windows installs a generic driver shouldn't matter what OS your running. You need to post a screen capture of device manager with 'sound video and game controllers' and 'other devices' expanded if it shows, with the Roxio USB capture device plugged in. He said he never tested it yet! I would like to see a screen capture of OP's device manager to see if the Roxio drivers even show before pinning it as a solution on fixing anything? If Roxio drivers aren't present Virtual Dub may use the windows installed generic driver? To be exact and to all who are having "No Video Signal" message on the preview screen in Windows 10. 1. Close Easy VHS to DVD 3 Plus. 3. After restarting, plug in the capture device (Do not turn on the source). 4. Go to Device manager. Click on Start > type Device manager > Press enter. 5. On the Device manager, expand Sound, video and game controllers menu. 6. You should see 2 roxio capture device entries. 7. Right-Click each of them and select uninstall. Click ok when prompted. 8. Unplug the capture device. 10. Download this drivers installer. 11. Install the driver and restart the PC after. This will only work if your device is the single piece device not the old one since that is not compatible with Windows 10.